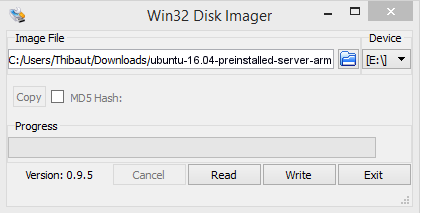 These steps will walk you through creating a bootable Ubuntu Core SD Card or USB flash drive. This will erase any existing content on the removable drive. The process is the same on any operating system, you will: download an image file, insert your removable drive (SD card, USB flash drive, etc. ), unmount it, replace the drive content with the image file content, eject the drive. Note that your removable drive must be DOS_FAT_32 formatted. In this example, /dev/disk3 is the drive address of an 8GB SD card.